Editor’s note: Senior Independent Study (I.S.) 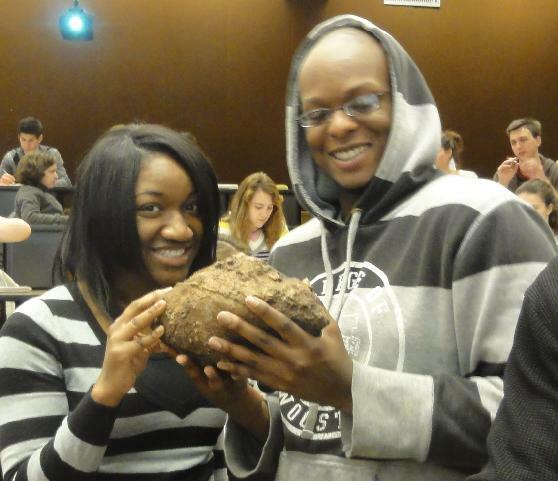 is a year-long program at The College of Wooster in which each student completes a research project and thesis with a faculty mentor. We particularly enjoy I.S. in the Geology Department because there are so many cool things to do for both the faculty advisor and the student. We are now posting abstracts of each study as they become available. The following was written by Megan Innis, a senior geology major from Whitmore Lake, Michigan. Here is a link to Megan’s final PowerPoint presentation as a movie file (which can be paused at any point). You can see earlier blog posts from Megan’s field work by clicking the Alabama and Mississippi tags to the right. 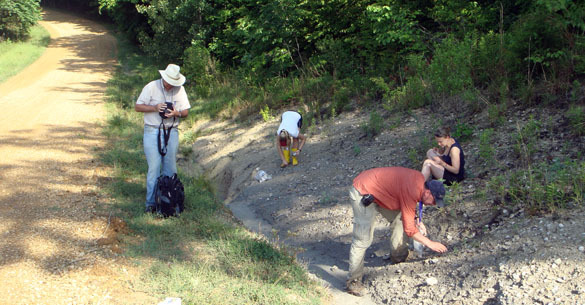 During the summer of 2010, I traveled to Alabama and Mississippi with my research team including Dr. Mark Wilson, Dr. Paul Taylor, and Caroline Sogot. Our trip was about ten days and included fieldwork and research. The purpose of our research was to collect fossils from below and above the Cretaceous-Paleogene (K/Pg) boundary to try and understand the Cretaceous mass extinction from a microfaunal level. I chose to focus my thesis on oysters and the sclerobionts associated with these calcareous hard substrates. Although my study was focused on oysters, I also collected a wide variety of other specimens including nautiloids, ammonites, belemnites, corals, sharks teeth, and bryozoans. The oyster species present in each system. When I got back to school in August, I identified all of my oyster species (three total) and began to identify and collect data for the sclerobionts. 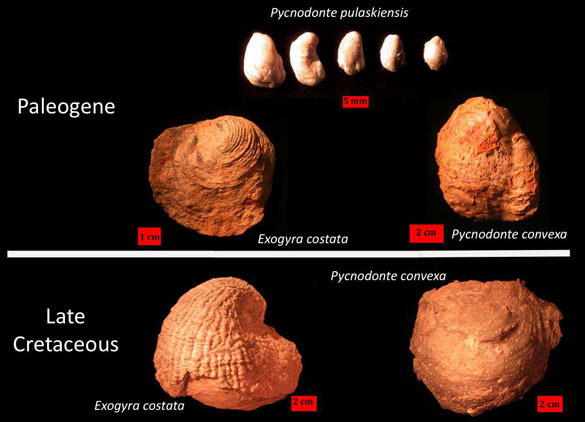 The oysters from the Cretaceous included Exogyra costata and Pycnodonte convexa and the oysters from the Paleogene included Exogyra costata, Pycnodonte convexa, and Pycnodonte pulaskiensis. Sample specimens that I collected in Alabama and Mississippi. The oysters in yellow boxes and circles are the oyster species that were used in my study. 1) Bioerosion of oyster hard substrates was common in the Late Cretaceous and Paleogene and sclerobionts were abundant before and after the extinction. 2) Entobia sponge borings appear to increase in abundance across the K/Pg boundary and become more common in the Paleogene. 3) Gastrochaenolites borings, made by bivalves, and serpulids were more prevalent in the Late Cretaceous, suggesting boring bivalves and serpulids were significantly reduced after the extinction. 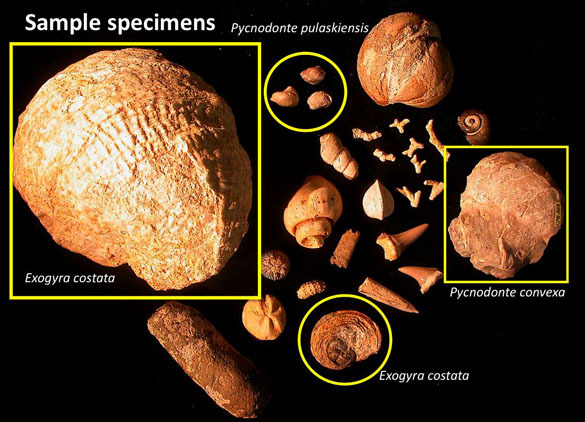 4) Encrusting oysters and foraminiferans were more common in the Late Cretaceous, but also relatively abundant on Pycnodonte pulaskiensis in the Paleogene. 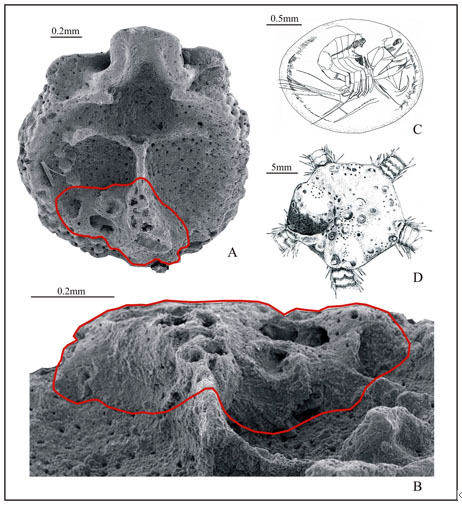 5) Encrusting bryozoans were more common in the Late Cretaceous and absent in the Paleogene, suggesting bryozoans were severely affected by the extinction. 6) Talpina borings were only found on Pycnodonte pulaskiensis in the Paleogene, but no significant data was collected elsewhere. To my knowledge, this is the first study of bioerosion on oysters across the K/Pg boundary. Reticulite is a delicate network of basaltic glass that forms during Hawaiian fire fountaining. Volatiles expand easily in the low-viscosity magma, creating a dense network of interconnected vesicles separated by thin strands of quenched lava (sideromelane). 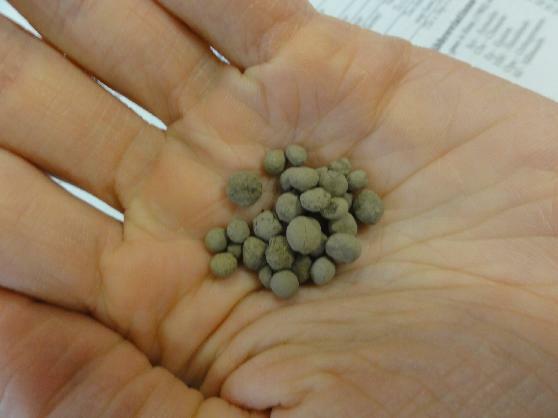 Accretionary lapilli are rounded pea-sized pieces of tephra that consist of volcanic ash. 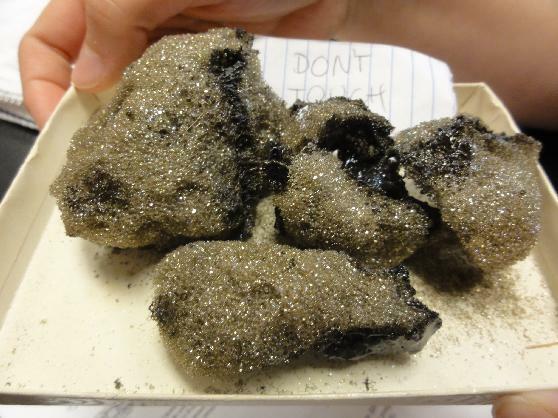 Ash aggregates into balls because of electrostatic forces in the eruption column. Volcanic bombs are formed when lava is ejected and becomes airborne. The fusiform bomb has a rounded aerodynamic shape with an elongated tail, which tells us that the material was molten when it was ejected and was shaped as it traveled through the air. 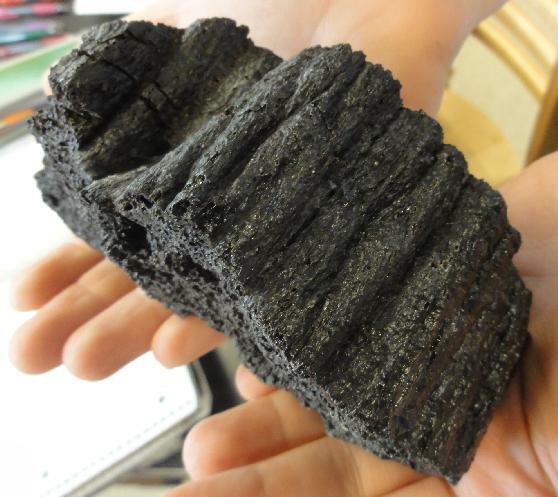 The glassy surface of this basalt shows the classic ropy texture of pahoehoe. Ropy pahoehoe develops when the surface of a lava flow becomes partially solidified and wrinkles as the underlying lava continues to flow. Moorellina negevensis Krawczyński & Wilson 2011; 1a – general view of the dorsal valve interior; 1b – oblique view showing brachial cavities and cardinalia. These tiny shells of Moorellina negevensis encrust corals and sponges in the Matmor Formation (Lamberti Zone, Upper Callovian, Middle Jurassic) in the Negev Desert of southern Israel. (Our species name means “from the Negev”.) They are prominent members of a diverse sclerobiont assemblage including tubeworms, oysters, bryozoans and various borings. Several specimens were collected over the past few years of our Wooster work in Israel. Wooster student Will Cary and I will return to these outcrops in Israel this summer for further Jurassic work. Moorellina negevensis is among the smallest of adult brachiopods, averaging only about two millimeters in width. It is the first species of the Order Thecideida found in the Jurassic of the Middle East. No doubt it escaped previous notice because it is so tiny! One of our specimens has a gall-like structure that we believe was likely made by a ascothoracid parasite in the shell. The ascothoracids are tiny crustaceans usually found as parasites in echinoderms and cnidarians. Parasitic (ascothoracid?) infestation in the dorsal valve interior of Moorellina negevensis; A – interior of the dorsal valve of Moorellina negevensis with parasitic (ascothoracid?) infestation marked in red; B – enlargement of parasitic infestation, posterior-lateral view; C – Synagoga paucisetosa Grygier, 1990, a recent ascothoracid parasite (redrawn from Grygier 1990, slightly modified); D – recent ophiuroid Ophiocten sericeum (Forbes, 1852) with the genital bursae infested by Ascothorax ophioctenis Djakonov, 1914 (redrawn from Wagin 1946, slightly modified). So a little fossil with the surprise of an even smaller fossil inside! 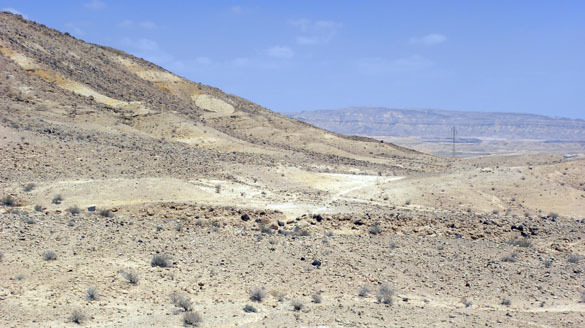 Matmor Formation exposed in the Matmor Hills, Hamakhtesh Hagadol, Negev Desert, southern Israel. Type locality for Moorellina negevensis. This kind of outcrop is heaven for paleontologists and sedimentary geologists. It is a beautiful desert setting.